You need good music and a stereo with excellent audio output when going on a road trip with family or friends. A car stereo makes traffic jams less frustrating because you can take your mind off the road by plugging in your phone and listen to your various playlists. Since good car stereos are expensive, you need to learn effective ways of How to Protect Your Car Stereo from Theft. Why do you need these tips on Ways to Protect Your Car Stereo from Theft? Because it enables you to receive compensation from your auto insurance provider as soon as possible. When the company realizes you have enough car anti-theft devices, they spend less time doing investigations. Avoid drawing unnecessary attention to your car because that’s the first step to setting yourself up for theft. 2. Now you Know How to Protect Your Car Stereo from being stolen! A faceplate is the outer covering of a car stereo that contains buttons and an LED screen required to operate the system. It also bears the stereo’s brand name and shows you where to insert your flash drive or memory card. When you remove it, it becomes impossible to switch on and operate your car stereo. Why do you need a car stereo with a detachable faceplate? Because thieves usually like stealing popular brands. Removing the stereo faceplate makes your car stereo indistinguishable and this discourages theft because no thief would want to risk getting caught over a nameless brand model. Moreover, car stereos that lack faceplates fetch poor prices in the used stereo market. There’s a glowing sense of achievement that comes with purchasing a car stereo manufactured by renowned brands such as Kenwood, Pioneer, or Sony. That’s why it’s trendy to put these brand logos on car windows and front doors. While these stickers draw attention and admiration, they also attract car thieves. Experienced car thieves know that these conspicuous logo stickers indicate the presence of expensive stereos. So, they trail the unsuspecting owner until he or she parks in an unsecured parking. It takes less than a minute to smash a car window and get away with the car stereo. Car owners install powerful amplifiers and subwoofers in trunks to ensure the bass sounds clean and prevent unwanted rattling. The trunk has enough room for sound waves to travel and bounce back without causing rattling on the doors and windows. If you own a hatchback, station wagon or truck and plan to install your speakers in the trunk, make sure you purchase a tonneau cover. You need it to conceal your costly amplifier and subwoofer when parking in public places such as convenience stores or malls. In addition to preventing theft, a tonneau cover prevents direct sunlight from coming into contact with your sound system. Direct sunlight is bad for electronics because it melts various circuit components. Earlier versions of Android car stereo systems lacked faceplates because they consisted of touch screens. Due to the high demand for digital car stereo systems, purchasing an Android stereo put the car owner at high risk of theft. Even though current Android car stereo systems require you to enter a security code, a thief can easily dislodge it from the dashboard. Sometimes, you just need to learn how to play tricks on thieves. In this video, the car owner explains how he got a mechanic to create a dummy faceplate that resembles an analog stereo system. Analog car stereos are unattractive to thieves because they lack modern features found in highly demanded models. You’ll realize how easy it is for a stereo thief to ignore your car after installing a dummy faceplate. Do you have an amplifier and subwoofer installed inside your car trunk? If yes, how safe is it from thieves? Car burglars who specialize in stealing amplifiers and subwoofers use modified screwdrivers that fit inside a trunk’s keyhole and turn the levers that control opening and closing. Some thieves are so experienced that they can gain entry into your trunk in less than a minute. In this video, the car owner explains how thieves stole items from his trunk after leaving it parked overnight at a Ford dealership. He shows how you can unplug a cable socket when parking your car overnight in order to prevent a modified screwdriver manipulating your trunk’s locks. What is a hood ornament? It’s a conspicuous brand logo placed at the front of your car’s hood. Think of the Mercedes logo or the Rolls Royce Angel. Nowadays, some car owners get customized hood ornaments as a fashion statement. However, these hood ornaments draw the attention of nearby stereo thieves. Experienced thieves know that cars with flashy hood ornaments also contain expensive car stereo systems. They will trail you and wait until you park in an unsafe area to grab your stereo. A car alarm system deters theft by drawing attention to your car. After purchasing an expensive car stereo system, you’ll feel a bit uneasy when parking your car outside a mall or concert venue. Since you can’t hire a 24-hour security guard, your best option of minimizing breaking and entering is buying a good car alarm system. No matter the amount of experience or talent, all car thieves flee whenever a car alarm goes off. Why? Because they know that either the car owner or nearby security guard will respond within a minute. 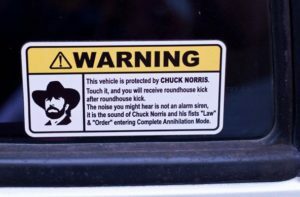 After reading these 7 pro tips on How to Protect Your Car Stereo from Theft, you know the little signs stereo thieves look for in cars. So, avoid drawing unnecessary attention to your car because that’s the first step to setting yourself up for theft. Also, get a good car alarm system to enable security guards in public parking lots to respond fast whenever someone tries to break inside your car.